Goldilocks & Her Doodle: Guest Blog Post: All About Aussies! 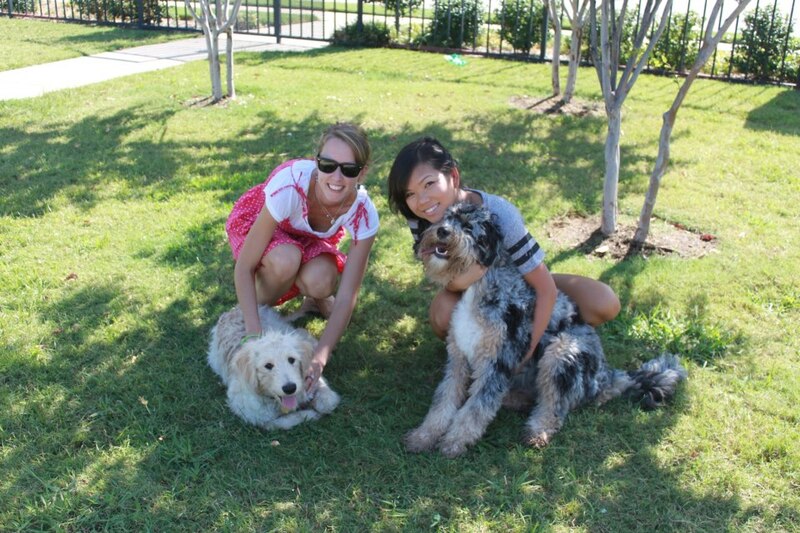 Welcome to my very first guest blog post by my good friend, Thuy, the proud owner of an Aussiedoodle (see picture below)! Thuy and I met via the popular doodle forum, Doodlekisses.com, and since we both live in Texas, friendship was just plain easy! After a bit of persuasively cajoling from me, Thuy graciously wrote a fun and informative post on Aussiedoodles. Please do read on...! Thuy: Two months before Hops came home with me, I had no idea what an Aussiedoodle was. 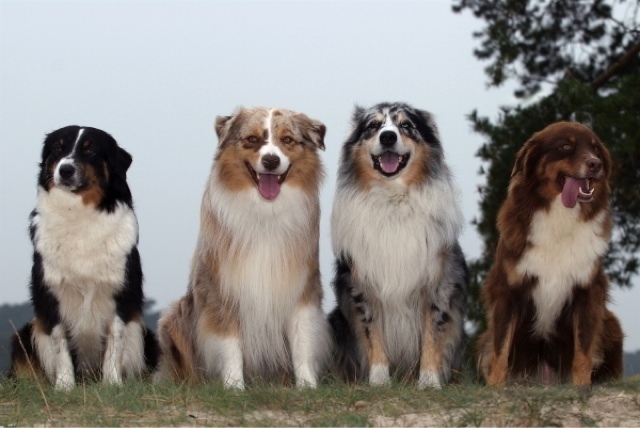 In fact, I had no idea what an Australian shepherd (Aussie for short) looked like! I was completely obsessed with the idea of getting another dog, and for over a month, I spent each and every day researching and looking at pictures/videos of dogs. I initially wanted a Havanese, then a German shepherd, next a Pomeranian, after that a Labrador retriever, and finally a goldendoodle. During my search for a goldendoodle, I was introduced to Aussiedoodles. I tried to educate myself by searching the Net for information on these babies. I didn't find much. 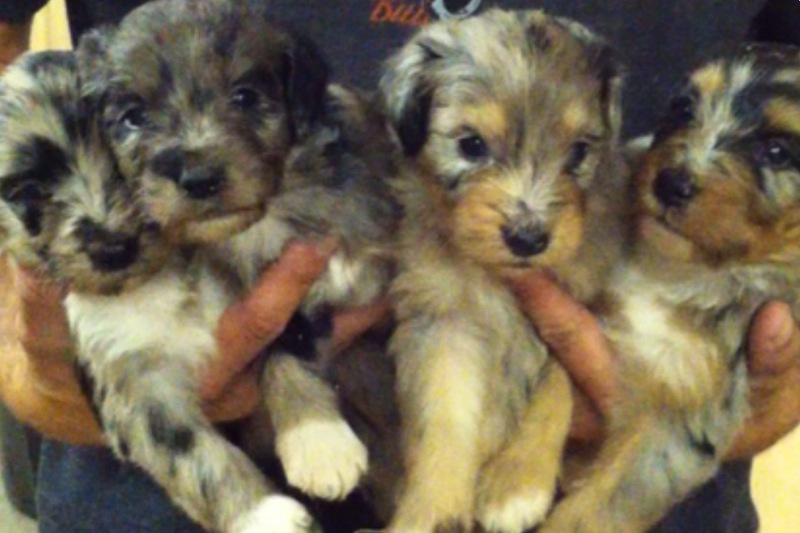 The pictures showed that Aussiedoodles all look so different from one another, and most pictures do not do this hybrid breed justice. Hops's father looks almost exactly like the third one from the left, and his mother was a standard black poodle. I do not believe that there are many non- first generation Aussiedoodles out there. It appears that the F1 Aussiedoodles have more consistency in their coat textures than other F1 medium/large doodles. I haven't seen (online) many Aussiedoodles with extremely straight or extremely curly hair, but they definitely do exist. From reading about doodles, Hops seem to have a lot in common with most labradoodles and goldendoodles. He has the intelligence/trainability of the poodle, and the energy and playfulness of the Aussie. A friend of mine who recently stayed with us for a weekend noted that the best thing about Hops is that he, "always just wants to please people." One of the first few e-mails I got from the breeder had a description for each dog, and I love reading it over once in a while. Her description of Hops still holds true, and it makes me smile reading it. Heidi: Well, Hops and Milton have hit it off, just like we suspected they might. The boys have had a couple of playdates so far, but more are in the works for the future. With as much fun as these two have, I am a bit envious of a dog's life! "Wading" in the pool is just as much fun! Thank you for the magnificent guest post, Thuy, and I hope to have more of the like in the upcoming months! I've seen Hops out on DK, too! So glad Milton has a super cool buddy, just a couple of dood hangin' out!